Kudos to the development team that put this wonderful product together A Tasy Pixel & Audanika. This has been one of the most straight forward reviews I have read, the excitement is growing and my iTunes store is loaded with money all waiting for the 10th Dec. I have followed this app through most of its stages of development (not always patiently I might add) and I am so pleased that from developer through to end users, it has been reported that its simple to use and it just works, Like SmiteMatter says sorry ACP, the game has been rewritten and now Audiobus will be the new standard of sharing. The possibilities seem endless from professional musicians creating wonderful musical work flows through to people who just want to have fun and play with different combinations of sounds and effects, from a simple idea to one of the most significant and game changing events in ios music making history imho to date. I have one small question, the little Audiobus remote I keep seeing on all my fav apps, is it fixed or can we move it to a different position on the screen to fit in with our workflow? 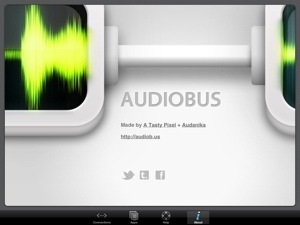 Great as audiobus may be, our creative juices are the real source of inspiration. 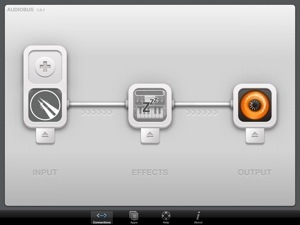 Audiobus should make it a lot easier to create without getting bogged down with all the technical issues. Keeping Monday clear for this long awaited event. with the many cool apps that keep coming out. Great review also!!! The possibilities are endless! This will make guitar recording much easier now. 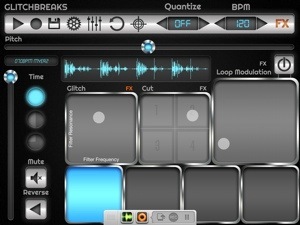 I can’t wait for all the other apps like beatmaker 2 to be implemented. Auria as well. The sequencer apps will be improved so much by audiobus. Copy/paste worked well for a while but now with audiobus, the iPad is continuing to become even more of a serious music creation tool. Ive been playing with this all week and watching lots of vidoes on how others have used it and wow. Just what was promised but reaching further than I expected, I have been charging my ipad almost twice a day because of this app and all its compatible apps. All I can say is the wait was worth it, I am so excited about what could be next I just dont know how they could keep improving it tbh as I personally havn’t came across any bugs but have noticed a few reported and they were answered fairly promptly with solutions.